Cheesehead Gardening: Who said you need flowers in arrangements? Whoever said arrangements needed to be made of flowers never had a garden full of hosta. The other day I went outside and gathered different colored hosta leaves from my garden and arranged them into a bouquet. The best part is that these arrangements last a lot longer than flowers. Ally, my cat also approves. It looks so nice! 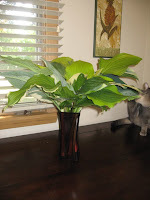 How long will Hostas last in a vase of water? Im thinking a Hosta is in my future! Whats the best Hosta for Sacramento, Ca weather. The area I want to grow them in, gets about 3-4 hours of full sun! I would think since you are in Northern California you should be able to grow them. When do the receive the full sun? Morning or Afternoon? If it's morning they will do a lot better. A great one to try might be Sun Power, since it's common and really brightens up with a little sun. Oh yeah, you will probably have slug problems in Northern California. So you might need to invest in some Sluggo or lots of ammonia. Its morning sun. And yes tons of slugs and snails. Nothin a little snail bait wont cure! Thanks for the info. So if I bought one this weekend, I could plant it. Do they perfer a certain soil? Or any kind. You could plant it. They will grow in just about any soil, they love water.